So, as is true with life, there are times when things happen that you don’t want. Or rather, expenses come at you when you don’t want them to. This blog-entry is about one of those times. 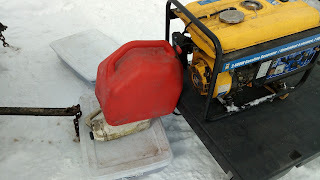 For the last week or so I have been having to run my generator more often. I thought that this was a result of the cold and my batteries not wanting to keep a charge when they are cold. Turns out, I was wrong. My first indication that the source of the problem was in a different location came at me one of the times that I started Jenny. I noticed that the voltage gauge was hovering around half of what it should have been. Instead of reading 120VAC it read 40 – 60 VAC. (As in half of regular wall voltage). Well, this past week I was running jenny every other day for two hours, this was becoming a real problem. The other indicator that there was a serious problem was the fact that devices that typically run fine (like my microwave clock) was turning on and off on its own. This led me to believe that I had some sort of wiring issue or what have you within Wanda. I looked at that voltage gauge on Jenny and this time took it seriously. I then pulled out my multimeter and then checked the voltage coming out of a wall socket in Wanda. This confirmed it, I was getting 40 – 60 VAC. In essence since Wanda and her systems were getting half of the voltage they expected all of her systems were browning out. Thus, while the engine of the generator was running fine, the actual thing that generates the electricity was faulty. Thus I spent some time doing some online research looking for a replacement generator. 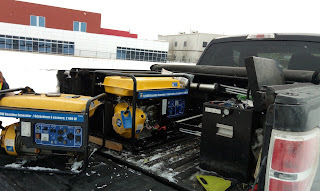 After searching and weighing cost vs. what I would get, I ended up getting a larger generator. Here is a shot of the old (and faulty) Jenny Mark II (on the left), and the new Jenny Mark III (on the right). The new Generator is a 7000 Watt Generator (I got it on special) it will kick out more than enough power to power all of Wanda’s systems fully. Its engine is twice as large as the old Generator but it kicks out almost three times as much power (2400 Watts VS 7000 Watts). One other nice thing (and was the kicker) was the electric start (with a pull cord backup). As you can see, this new Jenny is as tall as I can fit in the back of the truck and still close the tonneau cover. I had to take the wheels and extra foot off just to drop it down a few inches. I gave the old Jenny to the store for them to try to sell for the motor itself, or who knows. This is me salvaging the almost full tank of gasoline from the old Jenny. I can’t haul around junk and so everything has to have a purpose and a use, or it has to go. Why did I buy so large a generator when a 2400 Watt one would do? I figured that as long as I had to buy a new generator (I can’t function without one) I might as well upgrade. After all, I can afford it these days (and that is a nice thought). Yet this pushes my fiscal plans back even further, but I will be able to make up time, later this year. This year and the next is all about savings. There are times, however, when your best laid plans will be thrown a curveball, despite your best efforts. For me the key is to balance savings Vs comfort.